You and your family rely on your plumbing system every day, and it plays a huge role in keeping your home comfortable, clean, and convenient, so it needs to be kept in great shape at all times. At Cooper's Inc., our professionals specialize in plumbing repairs in Rossville, KS, and we'll always be able to help you keep your plumbing system in the best condition possible. We'll do whatever it takes to ensure that every part of your home's plumbing system is totally functional and efficient. 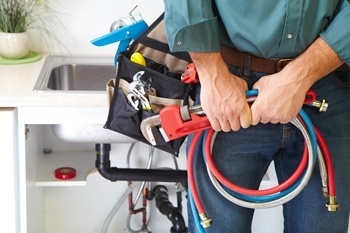 Our professional Rossville plumbers have extensive training experience, and no matter what kinds of plumbing services you need for your home, you can depend on us to get the job done. Our professionals plumbers will always be ready and eager to tackle jobs of any size, and we'll guarantee your satisfaction with all of our work. Call us today to schedule your appointment for plumbing repairs, and we'll be looking forward to assisting you. You and your family use your water heater every day for any number of different tasks, from washing clothes to bathing, so you need to know that it's always totally reliable. Your water heater is an extremely important part of the daily lives of you and your family, and when you have any problems with it, they need to be taken care of as soon as possible. Our Rossville plumbers will be able to accurately diagnose the problems your water heater has and perform thorough repairs. You need your AC to keep your home cool and comfortable throughout the summer months, but it's just as important to keep your AC energy efficient so that your cooling costs are kept low. Our Rossville air conditioning experts recommend you have an air conditioning tune-up performed once each year to prevent problems with your air conditioner and to keep it as energy efficient as possible. During the winter months, your heating system needs to be in great shape. Any problems with your home's heater are more than just an inconvenience. When the temperatures are low enough, they can be serious health and safety concerns. Our Rossville heating contractors will be able to provide excellent repairs to keep your home as comfortable and healthy as possible. If you are looking for a professional air conditioning and heating contractor or plumber in Rossville, KS then please call 785-267-4100 or complete our online request form.